1. 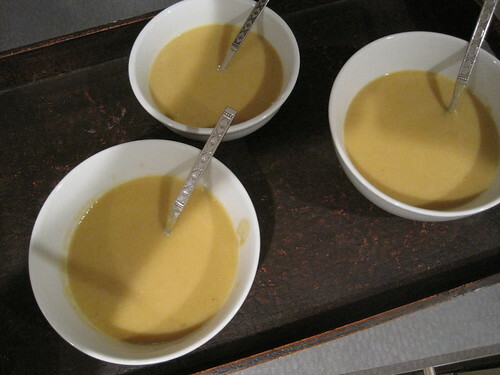 A sweet potato and fish soup (depicted above). I used a mixture of turnips, celery and onion cooked down in olive oil and butter to make a base for what I had in the fridge: sweet potatoes and some mediocre fillets of cod. The soup was pureed and a couple tablespoons of cream finished it off for a wonderful meal. I think there were enough veggies to counter the evil calories of the cream. 2. A more flavorful tomato sauce. On xmas eve, we had friends over for ravioli with tomato sauce (and smelts - yum). One friend was vegetarian so I was unable to flavor the tomato sauce with pork. Mirepoix to the rescue using a traditional mix of onions, celery and carrots - finely diced and cooked to a mush in olive oil. The resulting tomato sauce, made from cans of pureed tomatoes, was rich and flavorful. 3. A venison chili. This was a bit involved. I'll save it for another post. Coming up ... a lamb ragu. Thanks Andrew for opening my eyes to a long-overlooked classic culinary technique. why did you not define your cooking recipes?